.9The Micro Controller is designed for Astronomers and Astrophotographers who want the best in lightweight, compact, Grab'n'Go gear. Despite its small size, this controller is not small in its performance or build quality. It is well built and well thought out. This new version of the Micro controller comes with our standard RCA connectors. It will useable with our entire Premier and FireFly heater lines. The controller has two slotted tabs that can be used to attach the supplied lanyard so that the controller may be hung from a convenient location. Velcro tabs are also provided if you prefer to "stick" the controller to your telescope or mount. Also, the mounting tabs are convenient for anyone who wants to mechanically mount the controller with screws to a Dobsonian telescope base, Dobsonian upper tube assembly, inside an eyepiece box or wherever else one may wish to mount the controller. ELECTRICAL SPECS: 12 VDC, 3 amps. Single channel, one RCA output for heater attachment. Low voltage cut-off control. (a Kendrick standard!). RFI Clean. 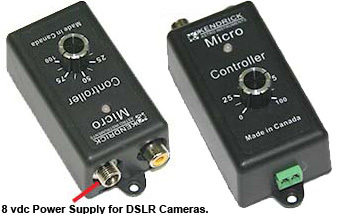 A must for CCD imagers! Reverse polarity protected (a Kendrick standard!). Mating Terminal Block power input. This will allow users to terminate the controller power cable in a connector of their choice. Fused power cable included (cigarette lighter plug).